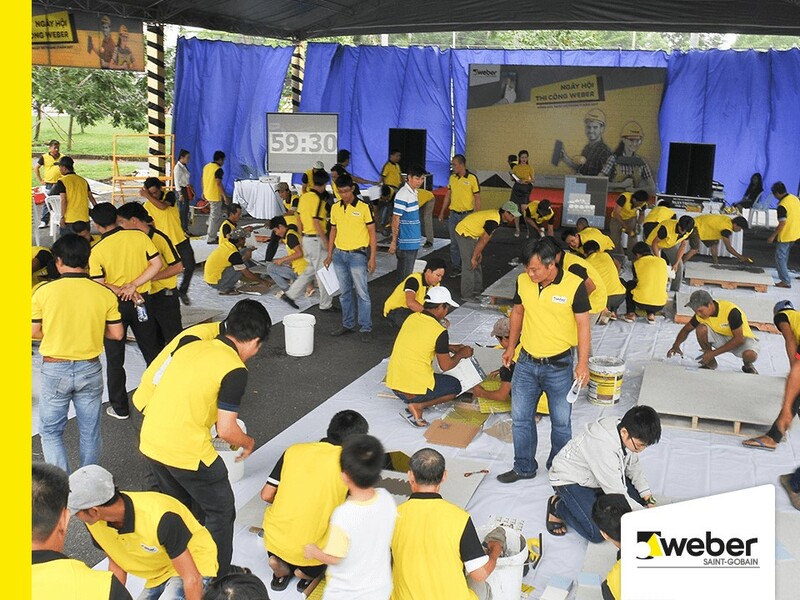 Following successes from the first Weber Tile Competition in Ho Chi Minh City in December 2016, the second one held in Long Thanh, Dong Nai on November 5th also attracted much attention. A large number of representatives of construction contractors throughout the South East. With the aim of equipping the knowledge of tiling with Weber tile adhesive, the competition has really created a useful playground for contractors, builders, and the opportunity for participants can exchange experiences and learn from each other. The introduction of new types of tiles such as granite tiles, granite tiles, porcelain ... bring more choices for users. However, this also creates a lot of difficulties for the construction team because these new building materials are extremely diverse from design to material, so the traditional oil tank construction is also less effective. fruit. If the choice of construction materials and methods of construction is not correct, over time, tiles are susceptible to peeling, cracking, affecting the quality and effectiveness of the construction as well as the prestige of the contractor. Understanding this, in order to enable contractors and builders to be provided with the knowledge and technical knowledge of new materials - brick adhesives, Weber held the 2nd Weber Construction Competition with large scale at Long Thanh Market-Dong Nai on November 5th/2017. The competition has attracted the attention and participation of a large number of contractors, builders throughout the South East. In particular, the organizers selected 10 teams, each team of 6 members to participate in the contest together. The competition is divided into two main sections, Training part and Experience part. Initially, participants will be trained in the theory to better understand the utility of using Weber products compared to conventional mortar as well as the difference in their quality. Following this, the Weber technician will guide Weber's team with the most efficient and effective tiling. With the spirit of learning as much as possible, taking part in the competition, the participating teams not only excellently completed their exams, but also accumulated useful experience, exchanged and learned from the units in They also have the opportunity to bring in attractive prizes. The award structure consists of a First Prize, two Second Prizes and three Third Prizes. In addition, each participant also received the meaningful gifts from the organizers such as T-shirts, raincoats, helmets, construction flights, etc. Let's look through the great moment of the Competition!